AMSTERDAM, The Netherlands — For the past two months the University of Central Lancashire, Cyprus (UCLan Cyprus) has been welcoming English speaking students to a new, €53 million campus, offering not only premium British higher education but also a technological breakthrough in the way in which they can engage with the digital teaching methods. A complete HARMAN audio system is at the center of the new facility with components from BSS Audio, Crown, JBL and Soundcraft. Situated on a 40-acre site in Pyla near Larnaka, the integrated AV infrastructure borders on the miraculous, not only for the implementation of an advanced Learning Information Systems (LIS) networkbut the speed with which local AV specialist (and HARMAN Professional distributor) ALA Equipment Co. Ltd. was able to redesign the original topology to provide a more future proof solution, after being brought in at the last minute. In fact, ALA carried out full turnkey planning and delivery of the €700,000 AV contract on the 8,000-square-meter campus in just the final three weeks of a fast track build time that was itself accomplished in only 180 days. The scope of work included equipping 15 single and double facing classrooms (in the first phase) with cutting-edge AV, as a precursor to a further 30 that will follow. 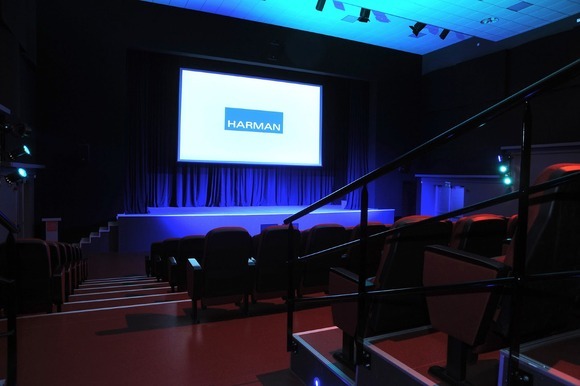 The other major challenge was to fit out a 310-seat lecture theater that had to double as a 5.1 cinema; it was here that ALA proposed a theater-spec technical solution, including JBL SRX712M and SRX718S which provides the 5.1 surround sound, powered by Crown CTs amplifiers. At front of house, a Soundcraft Vi1 digital mixing console has been specified to provide advanced, but easy-to-navigate mixing for the technical staff. Management of the theater I/O’s is via four BSS Audio Soundweb London BLU-160 processors using BLU link, BSS Audio’s proprietary network transport. Based on Gigabit Ethernet technology, BLU link carries 256 channels of fault-tolerant, low-latency audio at 48kHz/24bit, or 128 channels at 96kHz/24bit across a standard CAT5e connection—and thus provides an elegant and economical cabling solution. The whole network is on a Gigabit backbone, accessed via an HP Procurve network switch (100Mb 8 Port). At the same time, ALA’s generous tie line provision (along with SDI/3G video networked feeds) ensures that OB trucks can operate at the venue. Elsewhere in the foyer, where a sophisticated media display provides looped promotional footage while doubling as a relay screen from the lecture theater, sound reinforcement is provided by four JBL CBT 50LA column speakers, powered by Crown CTs amplifiers and controlled by dbx DriveRack 260 processors. These receive feeds directly from the Soundweb London processors, as does a large induction loop system. Meanwhile, in each of the first 15 classrooms to be equipped, the motorized front projection screen is accompanied by four JBL Control 24 ceiling speakers, powered by Crown XLS amps—allowing eight stereo inputs. In fact, thanks to this advanced deployment, there is now the possibility of distance learning and lecture capture whereby lectures conducted 3,600 kilometers (2,237 miles) away in Preston, UK are transmitted to Pyla.